Multi-page (also known as "funnel") testing is similar to A/B Testing except that rather than making variations to a single page, the changes you make are implemented consistently over several pages. Like A/B testing, site visitors of a multi-page test are bucketed into one version or the other. If you're testing the flow in a funnel, this is the type of experiment you should choose. Like A/B testing, Multi-page testing is simple in concept and can provide meaningful and reliable data with speed and ease. 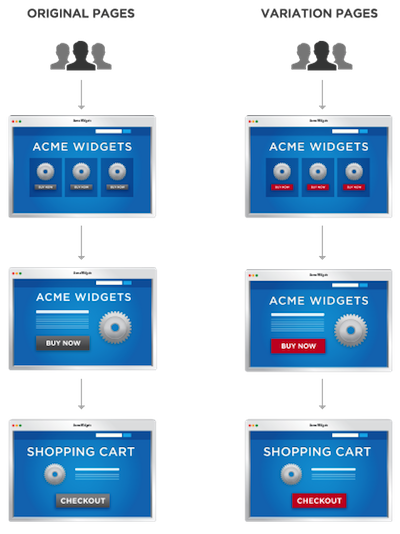 The advantage in multi-page testing lies in creating a consistent experience for the user. It allows for all users to see a consistent set of pages whether it be the original or a redesigned variation. Like A/B testing, multi-page testing is best used to measure the impact of only a few variables at a time. Tests with too many variables take longer to run; it will also be more difficult to determine the impact of each individual change you make to each page. When setting up a multi-page test you must have the same number of variations for every page that is part of the experiment. An uneven number of variations would create inconsistency between pages and lessen the experience for the user, as well as making any data collected difficult to interpret.